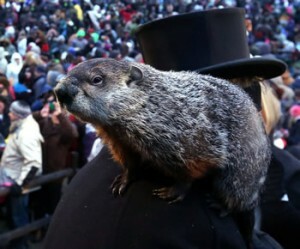 Pennsylvania’s most famous groundhog, Punxsutawney Phil emerged around 7:25 a.m. from his burrow and, after seeing his shadow, predicted six more weeks of winter. Meanwhile, New Englanders, on the heals of Blizzard Juno, braced for more snow today while Milwaukee began to unbury itself from its first winter storm that blew in yesterday. The latest storm is the most far-reaching of this winter season, stretching from Nebraska to Maine, according to the National Weather Service. Many states are experiencing accumulations of 10 to 16 inches, including northern Illinois, Indiana and northwest Ohio. Two week ago Boston had 5.5 inches of snow but now has picked up 40.6 inches and counting. The beloved Punxsutawney Phil, who made his first prediction in 1887, saw his shadow last February too—boosting his accuracy record as the majority of the country continued to experience record cold temperatures and snow events.